Leonard Riggio, the founder of Barnes & Noble, wants to buy back a slice of the bookseller he founded more than 40 years ago. But he doesn’t want anything to do with the Nook — just the stores and website. 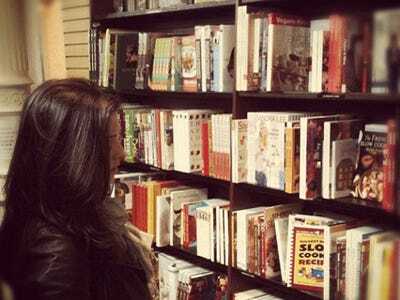 So, what’s the Barnes & Noble retail arm actually worth? Who’s Winning The Android Tablet Race? Localytics, a mobile analytics firm, has released a report on the current global market share of Android tablet, and it spells good news for Amazon. According to the report, Amazon’s Kindle brand holds an impressive 33 percent of the U.S. Android tablet market, followed far behind by the Barnes & Noble Nook, Samsung’s Galaxy series, Google’s Nexus 7 and other devices. 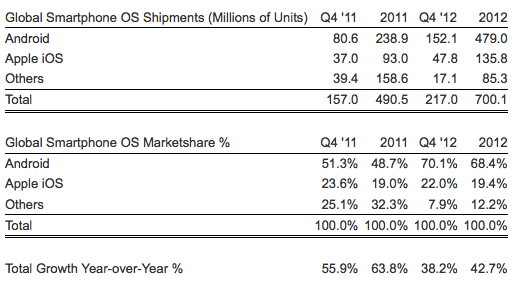 Apple’s iOS and Google’s Android combined to take over 92 percent of the global smartphone market in the fourth quarter of 2012, according to a report from Strategy Analytics. Publishers often want to work closely with e-book outlets — possibly a little too closely — but it’s rare that they involve themselves directly. Pearson is taking that uncommon step by making a 5 percent, $89.5 million investment in Nook Media, the joint venture between Barnes & Noble and Microsoft. Some of the reasoning won’t be made public until Barnes & Noble provides holiday sales results on January 3rd, but Pearson is clear that it’s furthering its online education plans: it wants Nook Media’s distribution skills to make a “seamless and effective experience for students.” Just when we’ll see this harmony is still up in the air, though. Nook Media has yet to outline what Microsoft’s partnership means for e-books and e-readers, let alone how Pearson factors in. We’re not expecting a sea change until companies start speaking up.